Looking for a boating holiday can be difficult because there are so many companies offering them and such a variety of different types. First thing to do is narrow down your options, determine the type of boating holiday that would suit you best. Is this a family boating holiday, quiet romantic getaway, a couple's or singles trip, or a taster for a wanabe sailor? You can chose anything from kayaking/camping to luxury yachts complete with crew. With such a wide choice there's something to suit everyone. For anyone new to boating why not try out a boating holiday on an inland waterway? There are many reasons why they are becoming more popular. For those who are a little nervous of being on the water for the first time, being close to land gives a feeling of security, however, this is no reason to become complacent, people still drown on the most tranquil of streams. And for many people, the attraction is to simply cruise along peacefully, moor up at the end of the day, get a good night's sleep and to be able to get off the boat and go for a walk, if they feel the need for terra firma. Another attraction is that many of the boat rental companies include some basic, boat handling instruction for beginners, before sending you on your way, on you own. For those wishing to get to sea, especially if you want some luxury, an exotic location and a safe relaxed holiday there are crewed charters of every conceivable level of comfort to choose from. You can also charter through a bareboat company and add a captain and or a cook, however a private crewed yacht can be comparably priced and can sometimes be better value. A Bareboat Charter is for those with enough experience and confidence in their abilities to sail the boat themselves. With these, the equipment standards and reliability can vary considerably, even within a company. So it could be a mistake to choose a boat purely by price, the cheapest boat may not always be the best value. A compromise between a skippered charter and bareboat are the numerous flotilla boating holidays. With a flotilla you can opt to skipper and crew the boat yourself and sail in company with other boats. As well as the reassurance of being part of a group of like-minded sailors, flotillas will have a 'Lead Boat Crew' sailing with the group, just in case anyone needs assistance. The 'lead crew' will also be familiar with the area so, they will be able to recommend the best anchorages, harbours, restaurants and places to visit. However, if you are serious about getting afloat why not make a training course your boating holiday. Boating holidays, yacht charters, rentals are available around the globe, you pays your money and you takes your choice. The Caribbean is probably the most popular destination. However, the time of year when you plan to take that boating holiday should determine the cruising grounds you consider. It is not just the cost or availability but the weather. There are some superb bargains to be had in 'off seasons', however theses are usually 'off seasons' because of the climatic conditions. Now it is possible that you could have superb weather off season, but a week spent in harbour, huddled in a small cabin while the wind and rain howl outside might not appeal to you. It is also worth considering other factors such as alternative things you might want to see and do on your trip. Perhaps you might want some diversionary experiences along the way such as the odd day ashore sightseeing or shopping. So, you need to plan your holiday on a stretch of water and with a package that caters for the activities you may wish to pursue. But it is your holiday so, if you may just want to relax and do absolutely nothing. A boating holiday can be a great experience for kids. But you do need to ensure that they understand the potential dangers, how to avoid them and how they should behave sensibly on the water. Even if your child can swim, it's recommended that you get them into the habit of always wearing a life jacket whilst on board. However,boating holidays aren't really suitable for babies and it can become very stressful having to maintain a constant vigilance on tearaway toddlers. Unless you have complete confidence in your child's ability to stick to the safety rules, you may have to reconsider whether or not a boating holiday is right for your family or if it would be better to wait until your children are a little bit older. What about your pet dog? 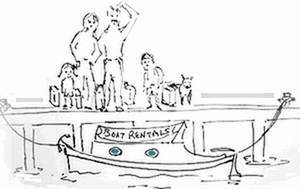 There are some boats which will allow you to have a dog on board, but most won't. But you should really consider your pet, even if it is allowed on board can its needs be catered for on route. Boating is meant to be a fun activity, however it is important to use your common sense and to remember that you are travelling on water. 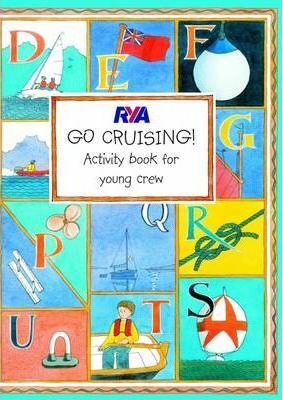 All reputable companies will, when you get to your boat, go through the health and safety guidelines and procedures on board, do pay particular attention especially if you are boating with young children. And be sure to have a safety net, let's face it, stuff happens. Let your friends and or relatives know when and where you are going and when you are due back and don't forget to alert them if you are delayed for some non-emergency reason. A boating holiday is supposed to be a relaxing time for you, away from the stresses and strains.